Compact, standard footprint packaged ICs simultaneously offer 100kHz bandwidth, industry-leading accuracy & exceptional crosstalk resilience. 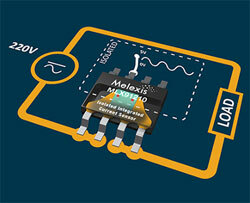 Melexis, a global microelectronics engineering company, has further expanded its comprehensive portfolio of current sensing devices, based on cutting-edge implementation of Hall effect technology, by announcing the MLX91210 family. Running off a 5V supply, MLX91210 ICs have current sensitivity levels down to 26.7mV/A and support linear current measurement ranges that span as far as ±75A corresponding to 30A RMS current. Available in SO8 and SO16 package formats, these fully integrated Hall-effect current sensors have extremely low resistive losses (0.8mΩ for the SO8 and 0.7mΩ for the SO16) and provide high voltage isolation ratings (2.1kV RMS and 2.5kV RMS respectively), as well as accelerated responsiveness (within just 5µs). The sensor output of each IC is factory-calibrated for a specific current range and compensated for optimal stability in relation to temperature and over the course of its working lifespan, so that long term accuracy is maintained. With provision to be factory calibrated for zero-current output point and sensitivity, each of these devices produces a linear analog output that is proportional to the current flowing directly through the IC’s leadframe. Inside the IC package, the magnetic field generated by the current flow is sensed differentially by two sets of Hall plates. This set up combats the effect of external fields and crosstalk. The close proximity of the Hall plates with the current conductor results in superior signal integrity, but at the same time a strong insulation layer separates the primary and secondary sides. The devices exhibit strong robustness against external fields, something that will get ever more critical as the density of power electronics designs increases. The key differentiator though is the virtually non-existent magnetic hysteresis that is witnessed, which results from the design not needing a ferromagnetic concentrator. A -40°C to 125°C temperature range is supported, and the sensors comply with IEC-60950 (furthermore the SO16 packaged devices adhere to UL1577). Thanks to their high speed and compact size, key applications for MLX91210 ICs that support both DC and AC current measurements, include precision current flow monitoring in power distribution units of server farms and data centers, power supplies and converters, demand response load control, household/appliance smart metering and energy intelligence, solar power converters and combiner boxes, and electrical motor control in general.